One of the things that our friends and family really hate is that we forget to wish them a Happy Birthday. Each person has his/her special day, but it's difficult to remember every single date, especially if you are slightly absentminded or very busy. If you use your computer every day, there's a program that will make sure that you don't forget your friends' and family's birthday or other important dates. This application is called Birthday Reminder. Birthday Reminder shows reminders of the birthday of the contacts that we have previously added to its database, before that date, according to how many days beforehand we want to be notified. But not only that, it also shows how many days are left to the date, and it even tells us how old the person will be. 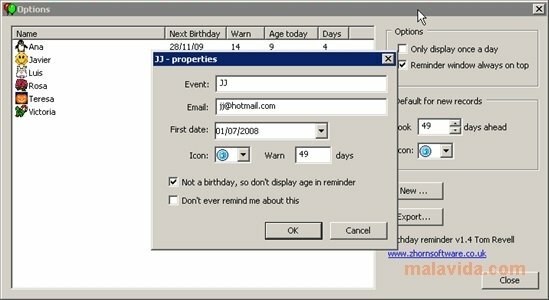 Even though it is specifically designed to store birthday dates, you can use it for other purposes. With the Birthday Reminder alerts we'll never have the problem of forgetting important dates.